How Does a Fund of Fund Works? Why Choose Fund of Funds? 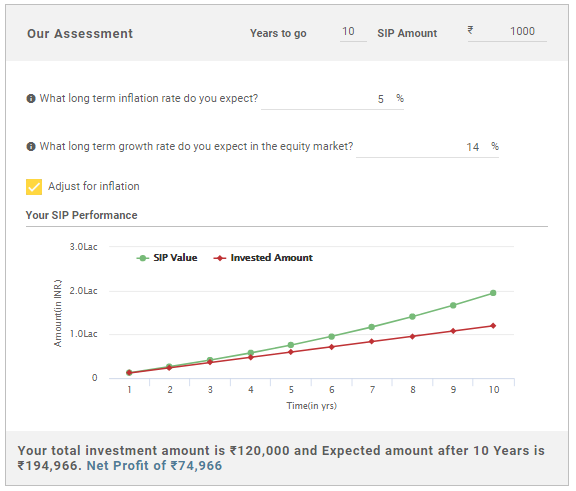 How to Invest in FOF Mutual Funds Online? fund of funds is one of the best mutual funds for investors whose investment amounts are not too large and it is easier to manage one fund (a fund of funds) rather than a number of Mutual Funds. 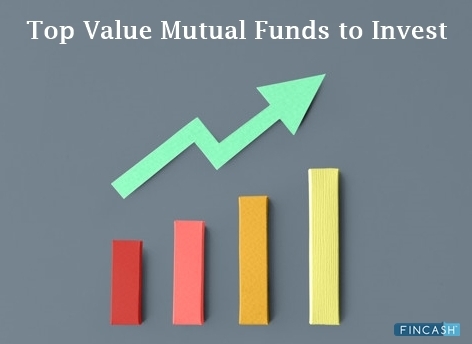 In this form of mutual fund investment strategy, investors get to hold a number of funds under the umbrella of a single fund, hence the name funds of funds. Often going by the name of multi-manager investment; it is considered as one of the mutual fund categories. One of the key advantages of multi-manager investments is that at a lower ticket size, the investor can diversify themselves across a gamut of mutual fund schemes. So let us go through the numerous aspects of fund of funds like why to invest in a fund of funds, advantages of fund of funds, fund of funds in India, the performance of fund of funds, and other important aspects. In simple words, a Mutual Fund Investing its collected pool of money in another mutual fund (one or maybe more) is referred to as fund of funds. Investors in their portfolios take exposure to different funds and keep track of them separately. However, by Investing in multi-manager mutual funds this process gets more simplified as investors need to track only one fund, which in turn holds numerous mutual funds within it. Assume an individual has invested in 10 different funds having exposure in various financial assets like stocks, Bonds, government securities, gold, etc. However, he finds it difficult in managing those funds as he needs to keep a track of each fund separately. Therefore, to avoid such hassles, the investor invests money in a multi-management investment (or a single funds of funds strategy) which has its stakes in different Mutual Funds. IDFC Asset Allocation Fund of Funds - Moderate Plan is a Others - Fund of Fund fund was launched on 11 Feb 10. It is a fund with Moderately High risk and has given a CAGR/Annualized return of 9.3% since its launch. Return for 2018 was 0.9% , 2017 was 15% and 2016 was 7.9% . Arpit Kapoor 18 Apr 18 0.79 Yr.
Franklin India Life Stage Fund Of Funds - 40s Plan is a Others - Fund of Fund fund was launched on 1 Dec 03. It is a fund with Moderately High risk and has given a CAGR/Annualized return of 10.8% since its launch. Ranked 13 in Fund of Fund category. Return for 2018 was 1.8% , 2017 was 15% and 2016 was 8.2% . Paul Parampreet 1 Mar 18 1.08 Yr. The primary objective of Scheme is to generate capital appreciation through investment in different Mutual Funds schemes primarily local funds based on a defined asset allocation model. However, there can be no assurance that the investment objective of the scheme will be realized. IDFC Asset Allocation Fund of Funds - Conservative Plan is a Others - Fund of Fund fund was launched on 11 Feb 10. It is a fund with Moderate risk and has given a CAGR/Annualized return of 8.5% since its launch. 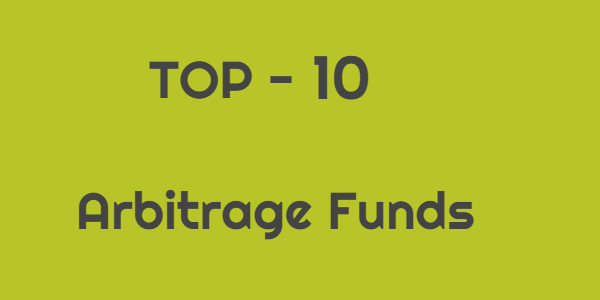 Ranked 20 in Fund of Fund category. Return for 2018 was 3% , 2017 was 10.7% and 2016 was 8.5% . Arpit Kapoor 18 Apr 18 0.95 Yr.
Franklin India Dynamic PE Ratio Fund of Funds is a Others - Fund of Fund fund was launched on 31 Oct 03. It is a fund with Moderately High risk and has given a CAGR/Annualized return of 14.8% since its launch. Ranked 24 in Fund of Fund category. Return for 2018 was 4.9% , 2017 was 15.5% and 2016 was 7.7% . Anand Radhakrishnan 1 Feb 11 8.08 Yr.
Franklin India Life Stage Fund Of Funds - 20s Plan is a Others - Fund of Fund fund was launched on 1 Dec 03. It is a fund with Moderately High risk and has given a CAGR/Annualized return of 14.9% since its launch. Ranked 13 in Fund of Fund category. Return for 2018 was -4.1% , 2017 was 25.3% and 2016 was 7.4% . The Scheme seeks to generate regular income through investments in debt & money market instruments, along with capital appreciation through limited exposure to equity and equity related instruments. HDFC Dynamic PE Ratio Fund of Funds is a Others - Fund of Fund fund was launched on 6 Feb 12. It is a fund with Moderately High risk and has given a CAGR/Annualized return of 9.2% since its launch. Return for 2018 was -2.3% , 2017 was 23.6% and 2016 was 9% . Anil Bamboli 27 Jun 14 4.6 Yr.
Miten Lathia 27 Jun 14 4.6 Yr.
IDFC Asset Allocation Fund of Funds - Aggressive Plan is a Others - Fund of Fund fund was launched on 11 Feb 10. It is a fund with Moderately High risk and has given a CAGR/Annualized return of 9.6% since its launch. Return for 2018 was -3% , 2017 was 22.3% and 2016 was 5.7% . One of the key primary benefits is portfolio diversification. Here, despite investing in one single fund, the investment is made in several mutual fund schemes, where the fund is allocated in an optimal manner with the aim to earn maximum returns at a given level of risk. Multi-management investment helps retail investors to get access to funds that are not easily available for investments. A single fund of fund can take exposure in turn to Equity Funds, Debt fund or even commodity based mutual funds. This ensures diversification for the retail investor by just getting into one Mutual fund. All the funds under this category are expected to follow a due diligence process conducted by the fund manager where they need to check the background and credentials of the underlying fund managers before making an investment to ensure the strategy is in-line with expectations. This is a good option for retail investors who wish to venture into this investment avenue with a lower ticket size. For understanding the modalities of how multi-manager investment functions, it is important to understand the concepts of fettered and unfettered management. Fettered management is a situation when the mutual fund invests its money in a portfolio containing assets and funds managed by its own company. In other words, the money is invested in the funds of the same asset management company. In contrast, unfettered management is a situation where the mutual fund invests in external funds managed by other Asset Management Companies. Unfettered funds have an advantage over fettered funds as they can exploit opportunities from numerous funds and other schemes instead of limiting themselves to the same family funds. 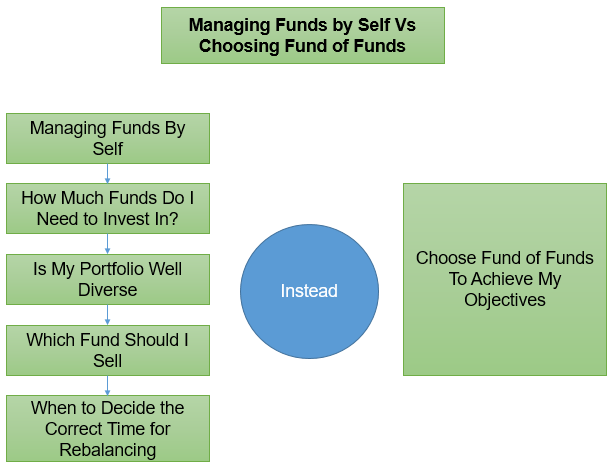 The following image gives clarity on how multi-management investment can help an individual instead of a simple mutual fund to achieve their objectives. Though multi-management investment has a lot of benefits associated with it, one of the important factors that one needs to be aware of is the fee associated with it. Investors should be aware of any charges or expenses that a mutual fund will attract and make their investments accordingly. 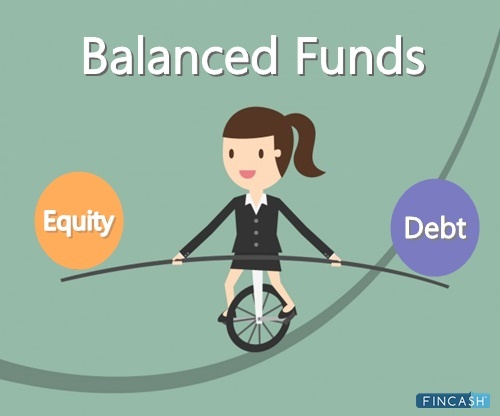 Therefore, in a nutshell, it can be concluded fund of funds is an ideal investment option for investors who seek to enjoy a hassle free investment in mutual funds. ☆☆☆☆☆ Rated 4.6, based on 9 reviews.